The larger northern section consists of forested mountains in which all the waterways originate. Annual rainfall is over 1,000 mm resulting in reliable and high flow regimes in the larger rivers. These have wide channels, well defined riffle and pool structure and high water velocities. Substrate is usually coarse material. The smaller southern area is flat farmland with unconsolidated deposits and a lower mean annual rainfall declining from 700-1,000 mm in the foothills to 500-600 mm north of Lake Wellington. Land use is grazing and broad acre cropping with intensive cropping and irrigation in the lower Thomson River and Macalister River valleys. The waterways in the forested, mountains are in near pristine condition. 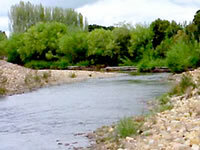 The main rivers can be reached by road by conventional vehicle but access to the tributaries often requires a 4WD vehicle. The rivers can be fished at road crossings but some walking is necessary to reach other fishing spots. Abundant and widespread angling fish are both species of eel, river blackfish, redfin and brown trout with some estuarine species such as estuary perch common in the lower reaches of rivers flowing into Lake Wellington. European carp have become established in the lowland waterways. Some waters in this Basin are commercially fished for long-finned eel and short-finned eel. (Large fish): Australian bass, Australian grayling, estuary perch, Gippsland spiny crayfish, long-finned eel, river blackfish and short-finned eel. (Small Fish): Australian smelt, climbing galaxias, common galaxias, congoli, eastern dwarf galaxias, flathead gudgeon, mountain galaxias and southern pygmy perch. Brown trout, European carp, goldfish, rainbow trout and redfin. A FMP has been declared for waters within this Basin. Victorian Fisheries Authority Management Report Series. West Gippsland Fishery Management Plan. No 56. July 2008. Stocking Program (stocking of desirable species is based on an approved Victorian Fisheries Authority stocking policy and is reviewed annually via Vic Fish Stock). In this Basin, Lake Glenmaggie and the Macalister River are regularly stocked with trout and Australian Bass are also being released when available. All the rivers carry self-sustaining populations of fish. Up to date and detailed information on numbers and size of each species stocked throughout Victoria can be found under Fish Stocking in the Fisheries and Aquaculture section of this website or in the annual Vic Fish Stock Report published by the department. Family Fishing Lakes Program (an ongoing project of stocking small waters within urban areas with larger trout, for junior and disabled anglers – see Introduction for further information). Waters within this basin are Lake Guthridge and Lake Guyatt in Sale, and the Racecourse Dam in Heyfield. Trout - above Lake Glenmaggie and Thomson Reservoir, Aberfeldy River and tributaries. Mixed - Thomson River downstream of Thomson Reservoir and Macalister Reservoir downstream of Lake Glenmaggie. Native - Junction of the Thomson and the Macalister rivers to Lake Wellington. Avon and Perry rivers and tributaries. River Health Program (an on-going State Government initiative to achieve healthy rivers, streams and floodplains) Major activities are willow removal, fencing and re-vegetation of banks, re-stabilizing beds and banks, reinstating fish habitat such as deep water and snags, and building fishways and fishing platforms. This work has been done on the Avon, Macalister and Thomson Rivers. Stream Flow Management Plans (an ongoing project in which various agencies and water user's develop a flow sharing arrangement which ensures an adequate environmental flow allocation for each river in Victoria. A stream flow management plan is being prepared for the Avon and Macalister Rivers, and environmental flows are already operating in the Thomson River downstream of Thomson Reservoir. - manage urban water diversion and the Thomson Reservoir respectively. The Thomson River (downstream of Thomson Reservoir to Cowwarr Weir) and the Aberfeldy River (in the Baw Baw National Park) have been listed as Heritage River Areas. The upper reaches of the Avon River including Turton and Dolodrook Rivers and Ben Cruachan Creek. The upper reaches of the Macalister River at Glencairn has been listed as a Representative River for East Victorian uplands, dissected plateau. The Gippsland Lakes, which are the receiving body for all water flowing out of this Basin. The Australian grayling and the eastern dwarf galaxias are listed as threatened species in Victoria. (Department of Sustainability and Environment [DSE] Dec. 2007). A list of Victorian threatened species together with scientific names of species, a definition of the terms used and their national status is available on the DSE website. Species in bold type are also listed under the Flora & Fauna Guarantee Act 1988. These species cannot be taken or kept within Victoria without a written order, license or permit issued by the Governor in Council.